Making your own homemade salsa recipe is a real treat. It’s not only delicious and satisfying, it’s healthy too. Fresh salsas are perfect during the summer for those BBQ dinners that need a tasty side dish or appetizer. 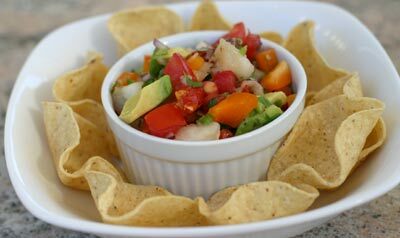 This salsa recipe is refreshing and takes advantage of the many fresh vegetables that are abundant this time of year. Try my recipe. Once you do, I promise you’ll be back for more. There is no comparison, to the freshness in flavor you get, with store bought. This recipe requires a lot of chopping. Don’t let that deter you from making it. I have included a video below to show you how to chop things efficiently to get the job done as quickly as possible. So you may want to check that out. Chop the cantaloupe, tomato, bell pepper, and avocado into 1/2 inch chunks. Chop the onion and garlic into a “super fine” mince, to really spread out those flavors. Cut and add the avocado last and sprinkle with the lime juice to prevent browning. Let the salsa sit for 10 minutes in the refrigerator to let the flavors mingle. Fresh salsas are best eaten the same day they’re made. Combine all the ingredients in a bowl except the avocado and mix well. Add the avocado and stir in gently. Let the salsa sit at room temperature for an hour before serving so the flavors can mix. Feel free to add or subtract any ingredients to this recipe. That’s the beauty of salsas. You are only limited by your imagination. Serve this avocado salsa with any of my Mexican food recipes.